One mainstay of Honda's much-awaited by the fans of two-wheelers, the most old superbike among its competitors that has undergone significant changes and was officially launched at Intermot 2016, with a former MotoGP world champion who is now racing in WSBK, Nicky Hayden became the star in the launching event. Not only has more aggressive design and also seem more slender, but the embedded technology in it also experienced a leap that so far compared to the previous versions. By using 5-axis Inertial Measurement Unit (IMU) to read all motorcycle movements, so it can be pinned latest technology such as slide control, lift control, even cornering ABS. Then there is the Quick shifter up and down which is a standard feature on this motorcycle. To support the tag line 'total control,' the motorcycle is equipped with a sophisticated suspension system ie Öhlins S-EC at front and rear, and used the NIX30 upside down fork at front and rear with the TTX36 shock absorber. The Suspension Control Unit (SCU) can read the roll rate, yaw rate and the slope of the motorcycle through a sophisticated device of 40g 5-axis (3-axis acceleration and 2-axis angular velocity) Bosch MM5.10 IMU gyro. Interestingly behind the dashboard, there're full digital panel indicator that looks similar to the Yamaha YZF-R1M speedometer. 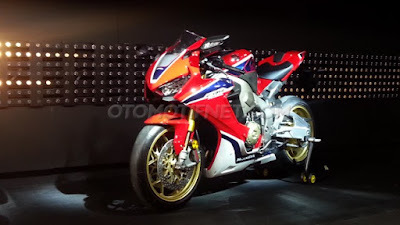 On its display screen, there're three riding modes, ie Street, Circuit and Mechanic, and the suspension setting mode can be setup here as well. The engine configuration used remains 4-cylinder inline, and bore x stroke still the same, ie 76x55,1 mm, but has used the throttle by wire, so now there are three ride modes. After done a variety of engine internal changes, including raising the compression ratio be 13:1, so that the power jumped 11 hp to 189 hp @ 12,500 rpm. The bike's frame is made of die-cast aluminum twin-spar, though looks big it turns 14 kg lighter than the previous version, now only 197 kg. Then the die-cast aluminum subframe is also very light, weighs less than 800 grams. In order to support agility, then its wheelbase being set only 1,404 mm and the seat height is 831 mm. If you are still not satisfied with the spec above? 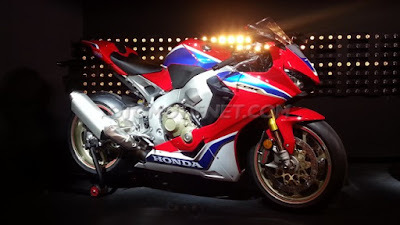 These Japanese renowned motorcycle manufacturer also has provided another version ie the CBR1000RR Fireblade SP2, which uses Marchesini lighter weight rims and made of carbon fiber body. Not only that, its performance is also more powerful, thanks to changes in the cylinder head, with larger valves, special camps and maximum cooling. Even, there were a sport and race kits from HRC for those who will use this bike in the race arenas.